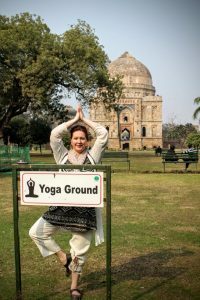 Audrey Forbes, a Yoga Pranala graduate from the United States, has shared her success story with us. From being passionate about Yoga, she pursued her dream to become a Yoga teacher. “Around 2006 I felt I needed some regular physical exercise and time away from the house. As I was homeschooling three children (twin sons and a daughter), I needed something I could turn to so I could mentally and physically recharge at the end of the day. “After having my twin sons, I struggled with back issues for many years. My last few months of the pregnancy really took a toll on my back muscles. Since going to a gym wasn’t my thing, I was looking for an activity on a regular basis that would tap into more than just the body. Hearing about Yoga one day, I decided to drop into some local Yoga classes. After six months of attending Yoga classes, my back issues were gone. It was like a mini miracle for me. “I also found myself changing in other ways through the practice of Yoga. My patience was increasing, and things that used to bother me weren’t so important anymore. I felt like an inner peace was taking over. Yoga was affecting me, physically and mentally. After practicing Yoga and noticing all the benefits, she started to think about Yoga as a lifestyle and even a possible career. “My decision to become a Yoga teacher was actually serendipitous…. “My kids had gone on to public school for the high school years and my plan was to return to the software testing industry that I’d left when my twins were born. But it was problematic getting my foot back in the door, due to the recession that hit our country. “Shifting gears career-wise, I began to rethink my path. I started my own redesign business and was doing some freelance writing on the side. Sitting in a coffee lounge one day during a writing session, I thought about Yoga teaching training and googled it. “One of the searches turned up a place in Bali. On a whim, I went to the link which was Intuitive Flow’s Teacher Training. As I read the information, I thought how life-changing it would be to attend. “I closed the page though and thought to myself: this was absolutely crazy. I wasn’t going across the world to a training for almost a month. But something drew me back to it within minutes and I opened the site page again: I couldn’t get it out of my head. “After a few days, I mentioned the site and training to my husband, sharing that in my mind I was being pulled toward it and that it seemed inevitable where I was headed — Bali. 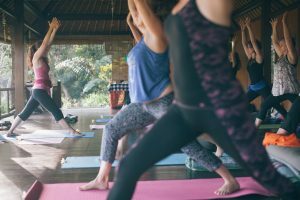 So in 2013 she enrolled into the 200 Hour Intensive Yoga Pranala Teacher Training in Ubud and spent 22 days with Linda Madani, her team of experienced teachers and other enthusiastic trainee-yogis. “I had prepared myself for the training physically, to be able to endure the intensive days. The training was very well planned, and the location was beautiful. “The staff was very nurturing and caring, and the training and activities were all very appropriate. I felt encouraged entirely in my choice after having attended the training. So many good memories, imprints on my soul for a lifetime. “My understanding of Yoga shifted during this training, in the way that Yoga is not just a thing we do as a business, a job to go to, or to get out of the house. I recognized it as a way of life and a tool to guide me through my days. I wanted to share that with others. After the training, she started teaching immediately in Kent, WA. “After completing the training and registering with Yoga Alliance as a 200RYT, I started immediately to teach. “I worked with my husband to design business cards, ordered props, mats, etc…while I was in Bali and was ready to hit the ground teaching when I returned home. My intention was to bring the light of Yoga to my local community, nurturing not just bodies but the soul sparks within people as well. “After my first training, I taught as a mobile studio for six months. In March of 2014, however, various pieces fell into place and I signed a lease on a building and began my brick and mortar studio, Soul Spark Yoga. “I have been teaching there ever since and have also added other teachers to the studio staff. 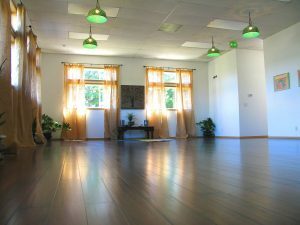 The studio offers many classes a week, such as Yin Yoga, Yoga Pranala with Yoga Nidra, Yoga for Relaxation, as well as private classes. In addition to the regular classes, offerings of series classes happen every few months on topics such as Ayurveda, Gunas & Chakras, Pranayama and Mantra, and Yamas & Niyamas. Many students have found these “extras” to be nourishing and informative. “In 2016 I made the decision to incorporate Mudra Pranala in the Yoga Pranala classes. The feedback regarding this was very positive and I feel very strongly that it sets the stage for a more mindful practice for my students as well as myself. As time went by and she began to teach Yoga to more and more people, she realized that a Yoga teacher’s learning never ends. She felt it was necessary to continue her training and receive the 500 RYT with Yoga Alliance. For that additional knowledge, she returned to Bali for the 300 Hour Intensive Yoga Pranala Teacher Training. “I was very prepared for the next level of Yoga Pranala since I had been teaching for three years. My main impetus for wanting to go to the training was the therapeutic part of the training to prevent injuries. “The YTT-300 training did just that, with therapy training, more Pranayama, and also more hands-on training with students.